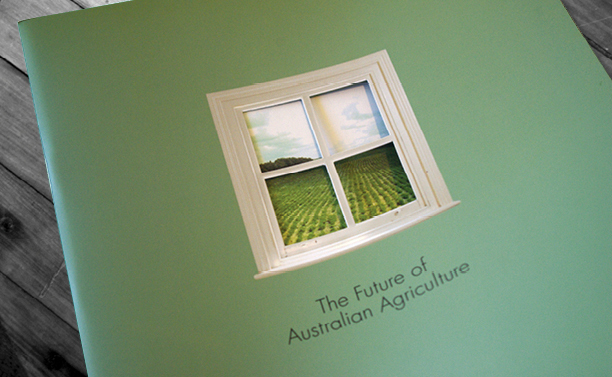 Brief: To design and produce an Annual Review which captured the CRC's vision to have an enduring positive impact on the future of Australian agriculture. The CRC was developing new farming systems that balanced water use and profit to manage dryland salinity. The Review needed to showcase the CRC's achievements and highlights; organisation structure; seven Research Programs; communication and education strategy; and resources and budget summaries. Rationale: A literal solution for the cover – a window into the future – seemed perfect for the theme. We professionally photographed the window and die-cut the 'glass' for a more interactive printed piece. The internal 48 pages were colour-coded as we'd done for the seven Programs' brochures, making the Review both informative and easy to read.